Setting its focus on its first state championship since 1986, Boulder City High School’s wrestling team claimed its third consecutive 3A Southern Region title Saturday, Feb. 2, in Overton. (Rich Viera) Boulder City High School junior Ladd Cox won first place in the 152-pound division by decision and will compete in the state championships Friday and Saturday, Feb. 8 and 9, 2019, in Northern Nevada. Avenging a late-season loss to rival Virgin Valley, the Eagles edged past the Bulldogs (204) with a team score of 213 points. Western (150) finished third. Seniors Dunagan and Ryan Vanario (220 pounds) and junior Ladd Cox (152) were crowned division champions Saturday to help Boulder City continue its dominance in the region. Dunagan won by pin, while Vanario and Ladd Cox won by decision. Trailing Virgin Valley, which crowned four division champions early in the meet, senior Thorsten Balmer (182) and junior Cade Cowley (170) put the Eagles over the top with a pair of second-place finishes. “Our team has been working hard all season so it was way fun to come out on top and see all of our hard work paying off,” Ladd Cox said. 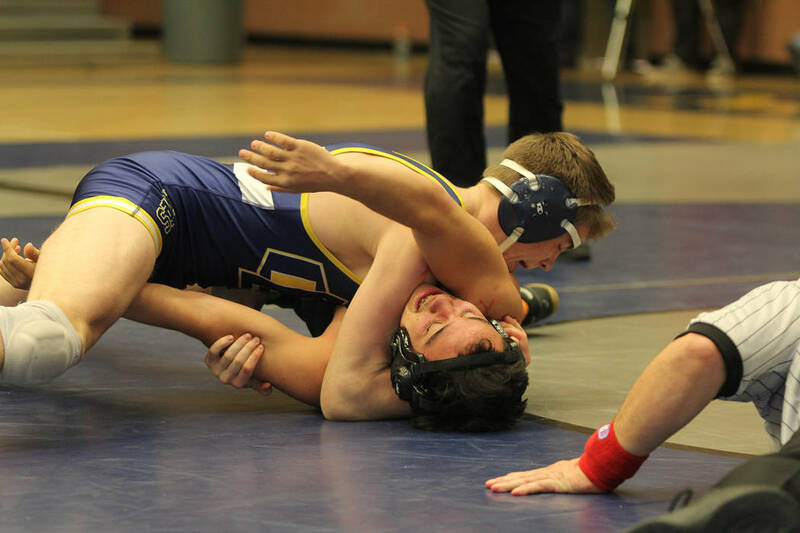 Fielding a region-leading 10 wrestlers in the top four, seniors Hayden Moore (160) and Mike Kaposta (285) and juniors Curtis Brown (126), Danny Pate (138) and Ayden Fradella (145) also cliched state tournament berths. Moore and Fradella each finished in third place at regionals. The Eagles will compete at Winnemucca Events Center starting Friday, Feb. 8, for the 3A state championship. Friday, Feb. 8, state championship, at Winnemucca Event Center, 3 p.m.
Saturday, Feb. 9, state championship, at Winnemucca Event Center, 9 a.m.